Here’s a little something fun to brighten up a sack lunch! Crispy Apple Chips are easy to make, and a very healthy alternative to potato chips. Even store-bought apple chips can be full of sulfites, corn syrup and artificial flavors…why not make them at home with organic apples? If you’d like, you can sprinkle cinnamon mixed with a bit of natural sweetener on top. They are delicious plain, too…the apple’s sweet-tart flavor combined with the crunchy-crisp texture make these treats an exciting addition to the lunch menu, or a satisfying snack. Start with a few of your favorite kind of organic apples. I love the tart flavor of a green apple, so I chose Granny Smith. Just wash the apples and dry them, then cut them into very thin slices (about 1/8 inch works well). 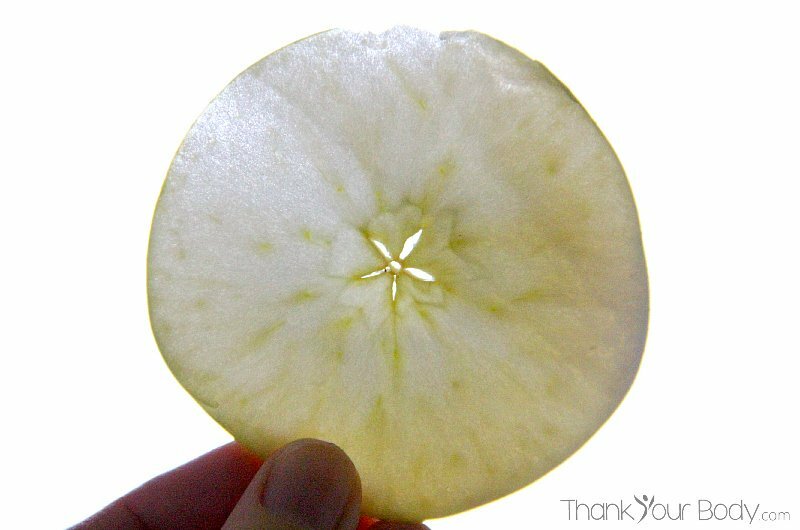 It’s kind of amazing how very little of an apple actually has seeds…when you cut an apple this way, you can really eat almost all of it. I love how pretty the slices are…the star in the center is so neat! 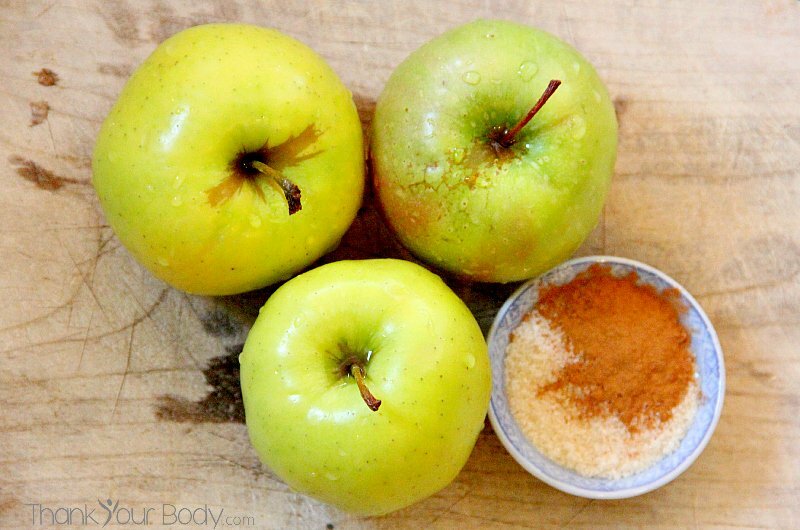 If you’d like to make cinnamon apples, mix together equal parts ground cinnamon and organic evaporated cane juice. Sprinkle this over both sides of the slices, and then line them up on a pan lined with parchment paper. Otherwise, just line the plain slices up on the paper. You’ll want to make sure they don’t overlap, but it’s a pretty simple process. Three apples will cover about 2 pans with slices. Place the pans in the oven, and set it to 200 degrees. Let them bake for 2 hours, then turn the oven off and let them sit inside until they’re crispy. This might take longer if you live in a humid area, so plan for maybe 4 hours total. Don’t let them get too brown, they are not very tasty when they’re overdone (sadly, I know this from experience). Store the slices in an airtight container, so they won’t go stale. These crisp little chips are wonderful dipped in fresh yogurt! They also give a PB&J sandwich an interesting twist when you sneak them in the center. Yum! There is something so comforting about crispy apple chips - and it's so easy to make your own! Yum! Wash and dry your apples. With a sharp knife of mandolin, cut the apples crosswise into ⅛ inch slices. If you're using the cinnamon and sugar, mix them together. Sift the mixture over both sides of the apple slices. Line 2 pans with parchment paper. Place the apple slices in a single layer on the paper. Let them bake in the oven for 2 hours. Turn the oven off. Let the slices sit in the oven as it cools, until they are crisp. Make sure that they don't get too brown, and remove them if they start to get overdone. Store apple chips in an airtight container. What’s your favorite lunch-box surprise?